Located in the heart of Ford Motor Country and The Henry Ford, America's Greatest History Attraction, the Best Western Greenfield Inn offers a truly unique experience in Dearborn / Detroit. Our hotel offers a Victorian design, combined with exceptional service and today's amenities you expect. Positioned 10 minutes from Detroit Metro Airport (DTW) and downtown Detroit and Cobo Center, you can easily slip away to the city for shopping, fine dining, or head to the airport to catch your flight. Just minutes from Marathon , DTE , BASF, AK Steel and US Steel, just to name a few, makes us the ideal location for business or pleasure! Culture and entertainment is all around us! Head over to one of our three famous casinos to test your luck. Sports are big business here too. Take in a Detroit Lions, Tigers or Red Wings game. And don't forget about the Theater district. Our full-service, Victorian-themed pink hotel is a local landmark and endearingly known as The Pink Palace. Some of our features include: 209 oversized guest rooms and suites, microwave, refrigerators, Keurig single serve coffee makers, full-size indoor pool, fitness center, business center and much more! Our guests are especially delighted with our full service restaurant and lounge, Mugly's. There is something for everyone on our menu. Popular dishes include steaks, burgers, pizza, and pasta. We're also an area leader in group tour businesses, which makes us a top choice for leisure travelers. We have many repeat guests that have been staying with us for many years. Guests looking for something a little different, while still being ensured excellent service, choose our Allen Park hotel. Service, quality and authenticity in Allen Park come together here. 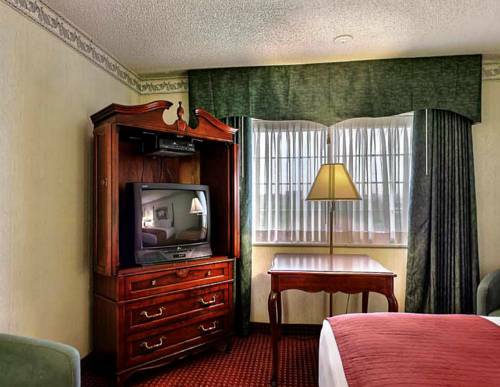 Reserve your upcoming stay at the Best Western Greenfield Inn! Mugly's Spirits: Mugly's Spirits, on premises, Bar/Lounge, American, Open for: dinner, hours are 4 p.m. - Midnight. Mugly's Food: Mugly's Food, on premises, Full Service, American, Open for: breakfast, lunch, dinner, Hours are: 6 a.m.-11 a.m. Monday-Friday. 6 a.m.-12 noon Saturday-Sunday. Dinner 4 p.m.-10 p.m. everyday. From: Interstate 75 North. Southfield North to Exit 4, Oakwood Boulevard. Turn right on Oakwood Boulevard and travel approximately one mile to Enterprise Drive and turn right. The Best Western Greenfield Inn is a quarter mile on the right. From: Interstate 75 South. Southfield North to Exit 4, Oakwood Boulevard. Turn right on Oakwood Boulevard and travel approximately one mile to Enterprise Drive and turn right. The Best Western Greenfield Inn is a quarter mile on the right. From: Downtown Detroit. I-94 West to Exit 206A, Oakwood Boulevard. Travel approximately one quarter mile to Enterprise Drive. Turn right, the Best Western Greenfield Inn entrance is two blocks on the right.